The idea was simple enough, if cloyingly well-intentioned. 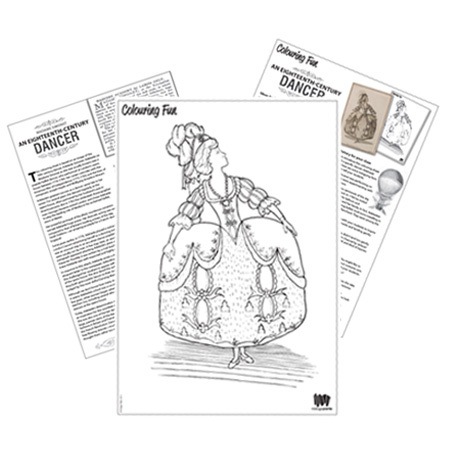 The concept was to create engaging activity sheets for ballet students that would bring ballet’s history to life. It was a brilliant thought … well, it seemed it could be. But the prototype has been conspicuously neglected since 2012. Was there ever a gap in the market? Does this prototype have any legs (she’s certainly got feet under that dress)? Here’s your chance to DOWNLOAD the experimental PDF activity sheet for ‘An Eighteenth Century Dancer’. It features Adelaide Simonet, and it’s free! So who was Madame Adelaide Simonet? Just over 200 years ago, the elegant Adelaide Simonet (pronounced SEE-MO-NAY or SEE-MO-NET – either is acceptable) was one of Britain’s most popular ballet dancers, reaching the peak of her celebrity in the mid 1780s. In 1782 the famous choreographer Jean-Georges Noverre visited London to stage his innovative ballet d’action, Medee et Jason. Adelaide was invited to play the leading role of the vengeful sorceress, Medea, and was revealed to be dancer of rare dramatic gifts. She even earned comparison with Britain’s leading actress of the day, Sarah Siddons. Adelaide Simonet as she appears in Bell’s British Theatre, 1781. While the year and place of her birth are uncertain, it is believed Adelaide trained in France before moving England in the 1770s. In London she danced at the opera house, the prestigious King’s Theatre, with her husband Louis Simonet, and also taught dance to the city’s gentry and aristocracy. Her three daughters learned to dance too, and became well-known on the London stage. Adelaide was well-liked, determined, and not afraid to stand up for the reputations of female ballet dancers and dance teachers when they were accused of promiscuity by male detractors. At the time, women who taught dance (dancing mistresses) were much less common than their dancing master counterparts. After Adelaide’s time at the King’s Theatre she was employed as a choreographer by Astley’s Amphitheatre – and female choreographers, in any era, are rarities! This assortment of achievements, plus the exquisite detail of the etching that depicts Adelaide (published in the popular periodical Bell’s British Theatre in 1781) provided the inspiration for the colouring sheet. An immediate consideration was how best to translate the image – whether to keep a semblance of Adelaide’s own features, or turn her into a generic girl-toy-figure. Finding an illustrator with a sense of period and an understanding of ballet bodies is, it must be said, not so easy. 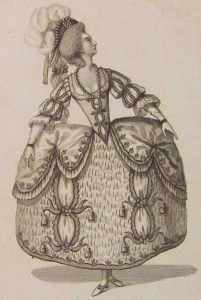 Incidentally, Adelaide’s portrait was one of just four dancer illustrations ever to be issued by Bell’s British Theatre, and shows Adelaide costumed as the Princess in the ballet Ninette à la Cour. The publication of these images (which included pictures of Auguste Vestris, his father Gaetan, and Giovanna Baccelli) was prompted by the wave of interest in ballet brought about by Vestrimania. Test and trial, tweak or toss aside … ? That’s a little on the project’s background. Click away to download the PDF of this quirky prototype, and you’ll discover even more surprising facts about Adelaide Simonet than you’ve already read here! Give the activities and notes a read, try the colouring sheet with the littlies, and don’t hesitate to send a photo or scan of the results. All importantly, please comment below with your thoughts and suggestions – your feedback is invited! Is the activity sheet relevant or useful? Would you use it as a dance teacher or parent? Beneath that pretty yet cumbersome, well-intentioned costume to colour in, is there a dancer, or a concept, with legs? !